Today was an easy ride. The route was flatter, winds were mostly calm or from behind and there were several towns to cross. Started early again and the ground was wet and slight hint of drizzle but mostly dry. 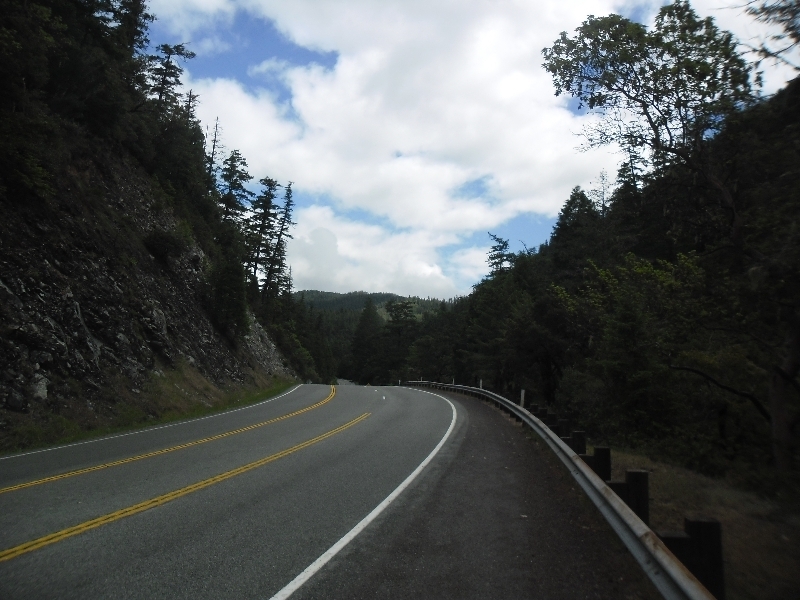 Already some traffic out on the Redwood Highway but road was good with small shoulder. Cycled with few ups and downs in first 11 miles when a sign told me elevation 1640 and then more descent from here to Grants Pass. Stopped briefly in Wonder where photo above was taken. 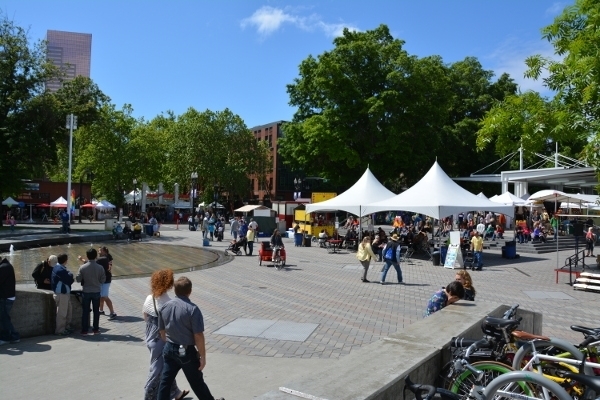 Road became both wider and busier as reached Grants Pass. Stopped here for breakfast at 27 miles. After this followed CA 99. This route went parallel to I-5 so contained mostly local traffic. 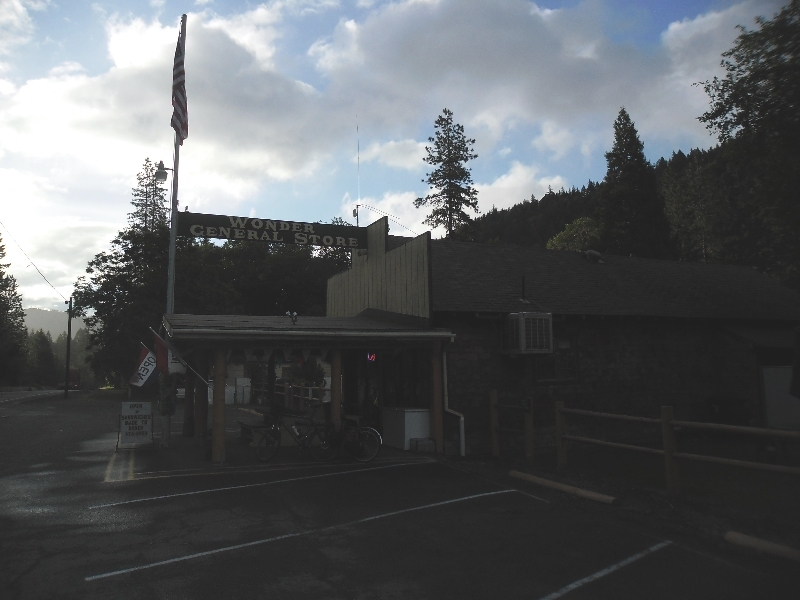 In the first 10 miles after Grants Pass we went close to river and there were many different places to stay. After this crossed the river and went via Gold Hill with a slight hill to climb and then descent into towns of Central Point at 53 miles and Medford at 57 miles. After Medford there was slight uphill grade. Road still continued well and sign below was at entrance of Ashland. This town is both a tree city and a bicycle city. Also known for holding Shakespeare festival and shows through the summer. Given the ease of route was done for day by 1pm and otherwise had relaxing afternoon. Now sorting out route choices from here. Left the coast today as I’ll start to head more eastwards. It was foggy and misty this morning but dry when I departed. Came through main parts of Brookings and then headed south on four lane highway. After few miles it narrowed and then at seven miles I crossed the border to California. As I took a picture of the sign, the drizzle picked up and it started raining lightly. Just inside California I passed the fruit inspection station but they waved me through. Shortly after this the cycle route departed from 101 and went onto county road D5. It was quiet cycling the county road as it bounced some slight hills and then came across town of Smith River. Signs here proclaimed the area as Easter Lily Capital of the World. At 17 miles came back to 101 again and just thereafter was a bridge across the Smith River. Rather than take the bridge I was on CA 197. It went through forest and in this next area were some tall redwood trees. At 25 miles it joined up to US 199 and two miles further was Hiouchi and chance to get some breakfast. Caltrans workers told me the road would have reasonable grade with slightly steep at the top. Also a few narrow parts but otherwise good road. 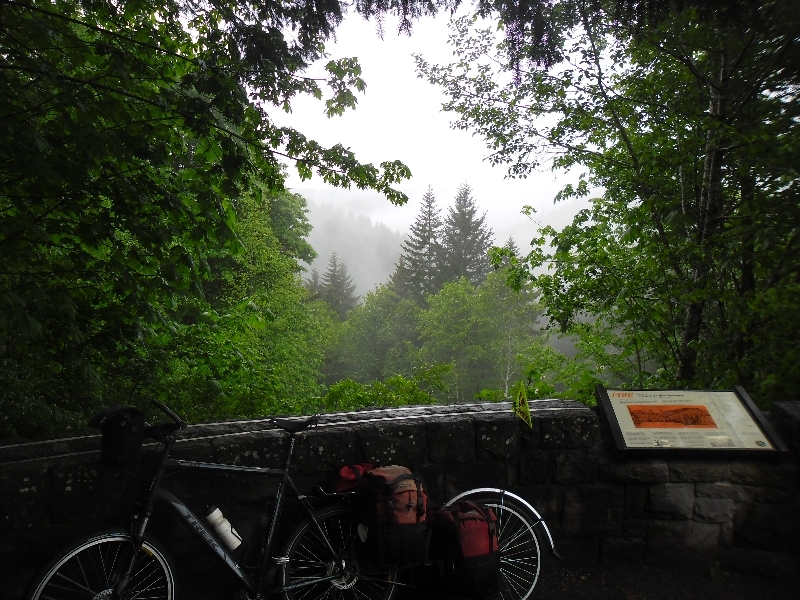 It continued raining as I passed through Gasquet at 34 miles but stopped closer to 40 mile mark. The sun came out and turned out to be a nice day. As reported, the road had periodic sections of very narrow road going through steep canyon but also some parts with four lane road. Overall, traffic wasn’t too heavy and was well behaved. At 46 miles a stop along the way and then I rode the last bits to 53 miles at top of the hill, ~2000ft elevation. 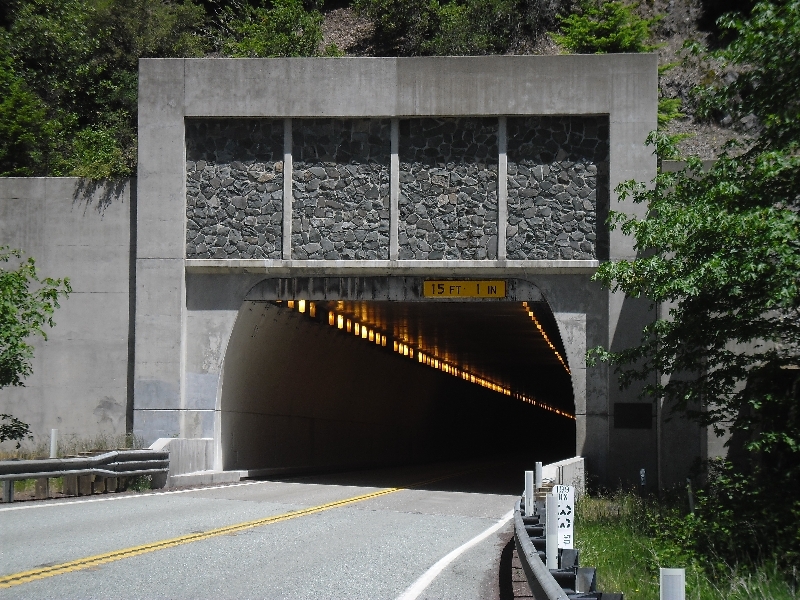 At top of the hill was a tunnel with a bicycle button that would cause lights to flash. 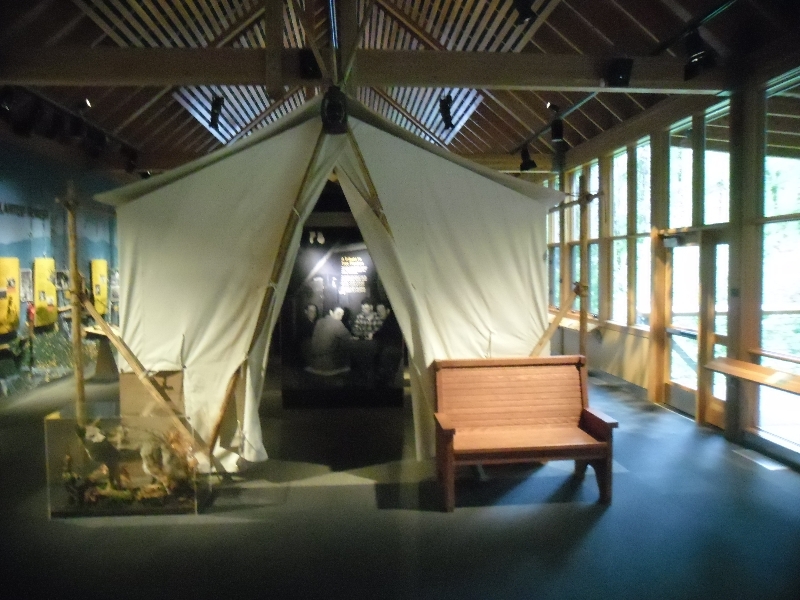 Also here was a rest area with tourist information about Del Norte county. I pushed the button and rode through the tunnel assisted by slight downhill. After this point I had more downhill than up. 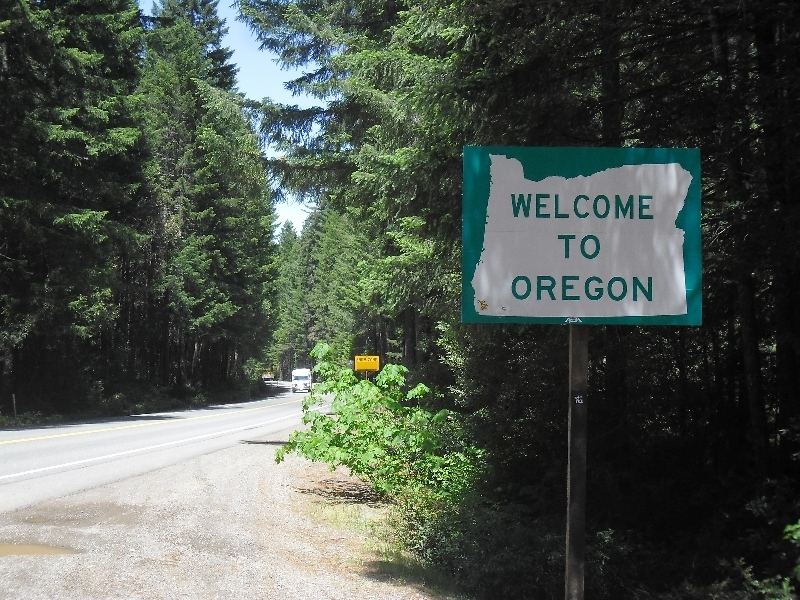 At 56 miles, I crossed back into Oregon again. 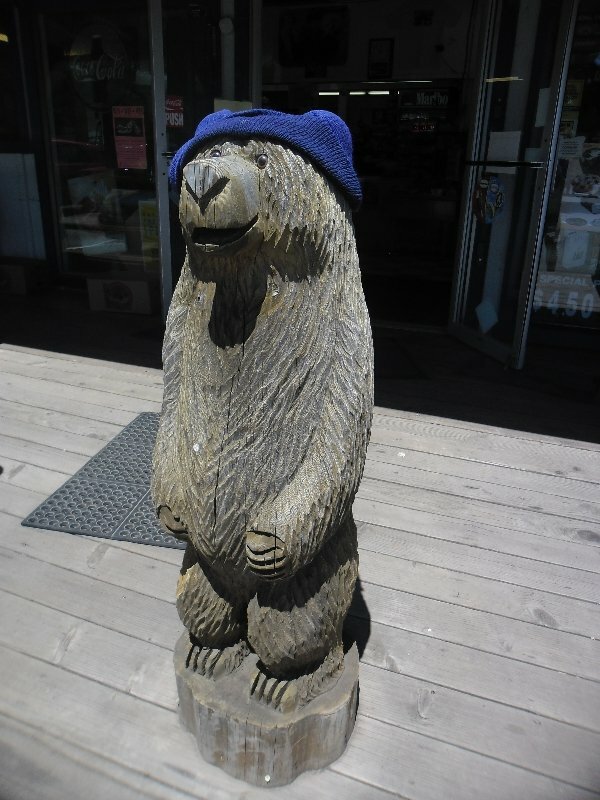 At 61 miles was a store at Obrien with this carved bear out front. 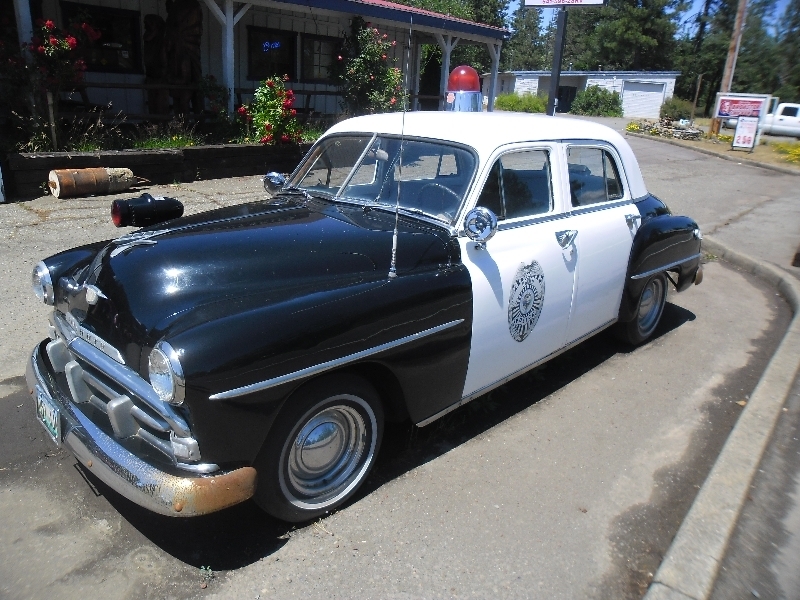 Also an old police car. There wasn’t much else in Obrien and so asked if there was motel in Cave Junction. They hesitated and instead of answering my question said, “you are better off in Kerby”. At 69 miles came through Cave Junction to see the motel they didn’t describe and otherwise the town area. Two miles later stopped for the day. Expect as I go eastwards that it will also get drier. Looking up climate data for average precipitation: Brookings – 78 inches, Cave Junction – 61 inches, Grants Pass – 31 inches, Ashland – 19 inches, Klamath Falls – 14 inches. Today was a short day. Weather forecast indicated a storm was moving through and when I looked out the door at 6am, it was tempting to make a rain day. However, decided to ride to Brookings since that would leave better options the next day. Got on the road shortly before 7am. Not far out of Gold Beach the road started to climb up over Cape Sebastian. Had both wind and rain, though fortunately as I climbed the trees blocked some of the wind. At 4 miles was at 750ft and top of the hill. From here level for a mile and then a few miles of descent. The wind was much stronger where went across open areas along the sea. At one point even had a gust strong enough to stop most forward motion. There were rocks and others visible along this part of rugged coast. Slowly rode along with rain jacket keeping the wet out and without too much difficulty came to outskirts of Brookings. As I reached the commercial district, I saw a motel between a laundromat and a Subway restaurant. Across the street was a Mexican restaurant. 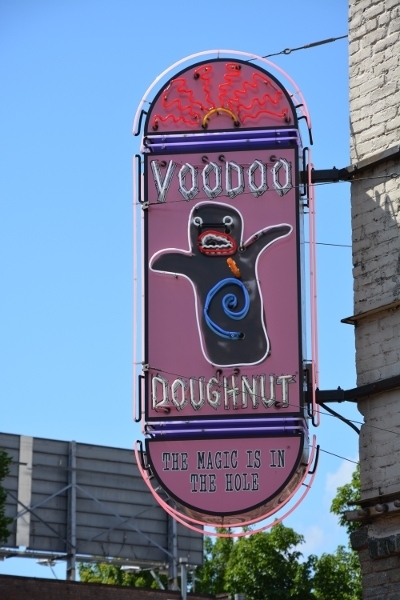 Looked like a good place to stop on a rainy day. Fortunately weather forecast looks a little better tomorrow. Some beautiful cycling today under mixed weather conditions. Started early again and was just two miles to sleepy fishing village of Charleston. However, the village wasn’t so sleepy as the convenience market was doing good business at 6am. Not sure if these were fishermen or just early birds but in any case was a good spot to get a few pre-breakfast items. After Charleston the route went via Seven Devils Road and this started with a steep climb to start. After this more rolling terrain. However, was otherwise nice and secluded as went past some forest areas with just a few vacation homes mixed in. Skies were overcast with just a touch of drizzle but it was still pretty cycling. At the 18 mile mark this route came back to US 101 and then another 5 miles into town of Bandon where I stopped at cafe for breakfast. This cafe was also doing good business. As I left Bandon, I took the scenic route. Some large rock stacks out in the ocean including Face Rock. Was a nice loop that then took me back to US 101 again at 29 miles. The next stretch was mostly through wooded areas. This was still appreciated since the open areas tended to have more of the headwind that was 10-15mph from south west. At 32 miles took a photo of a large bird made from recycled ocean debris. Otherwise was reasonable cycling and not too many hills. However weather became wetter as went through mix of drizzle and light rain for a while. 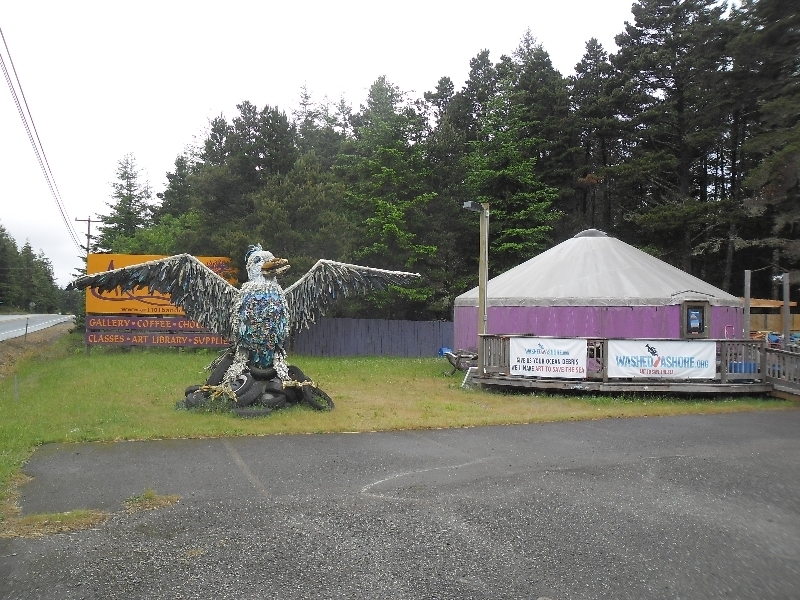 At 53 miles came to town of Port Orford. Stopped for lunch at the Crazy Norwegian fish and chips shop. Was a good place and out of the wind. 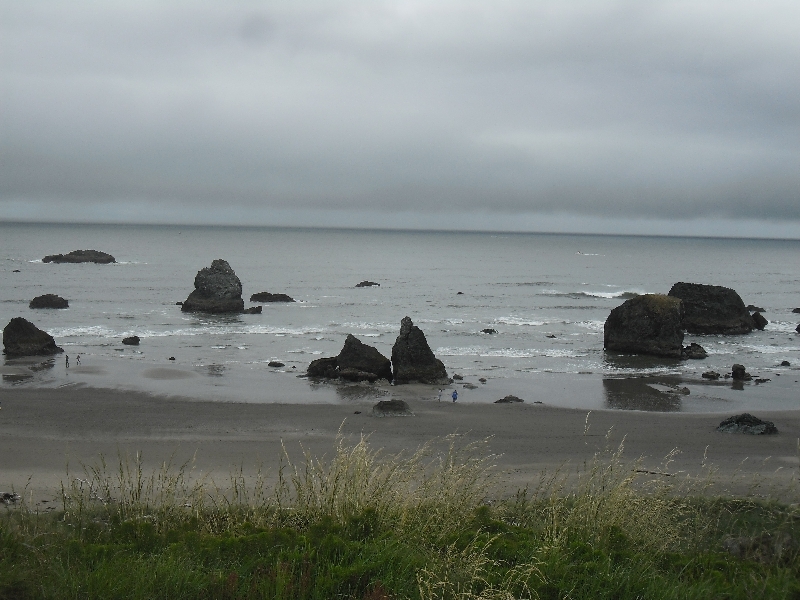 After Port Orford, the route went more along the ocean and was a bit more exposed. The rain stopped and had some good views of the sea stacks. 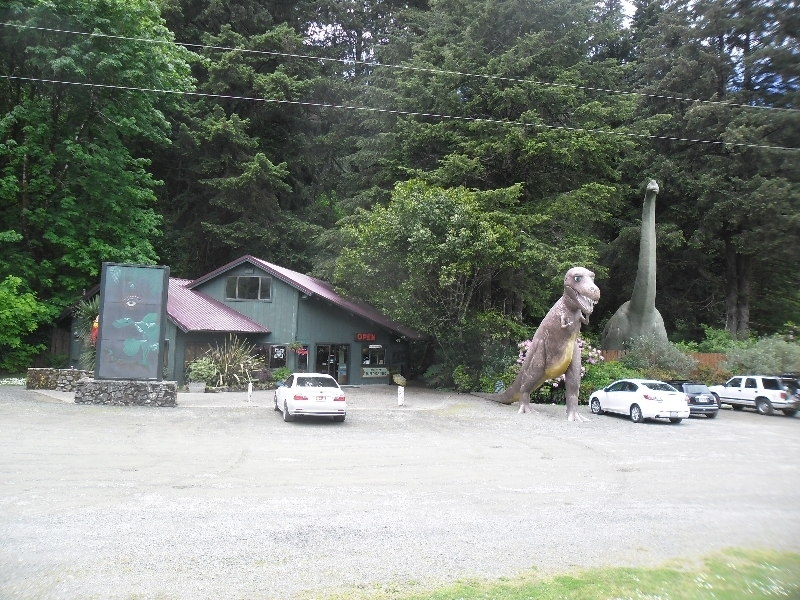 Also came past some tourist places including one with large sculpted dinosaurs. Finally at 78 miles came last bit across a bridge on the Rogue River and then across into town itself. Found a good motel and otherwise a nice place to stop for the night. Been looking at the maps and likely will head inland on US 199 once I finish the Oregon Coast. Need to see exact timing since there might be weather front passing through the area. Beautiful ride today along the coast. Fortunately, the weather was much better than the previous three days. Started out early and didn’t take me long to notice that the chain made scraping noises. So stopped and added some lube which helped things. 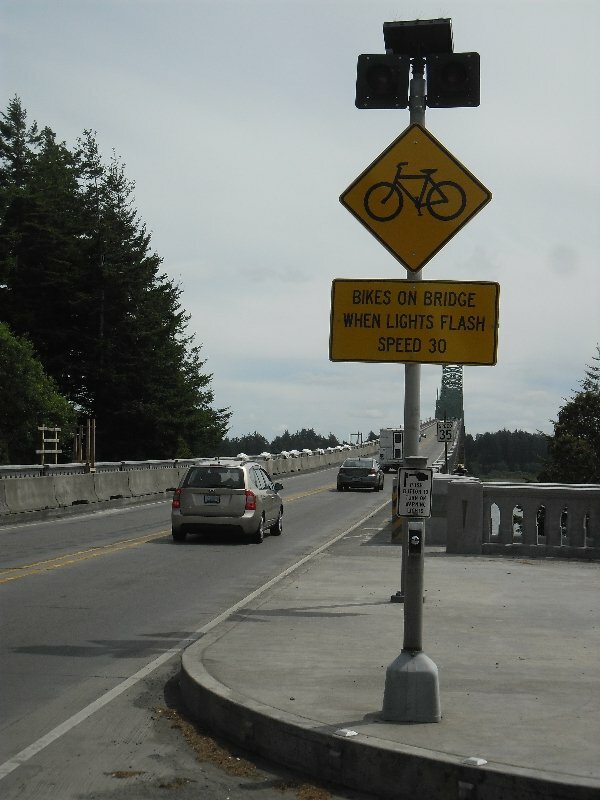 After that cycled back to 101 and then across the bridge into Waldport. 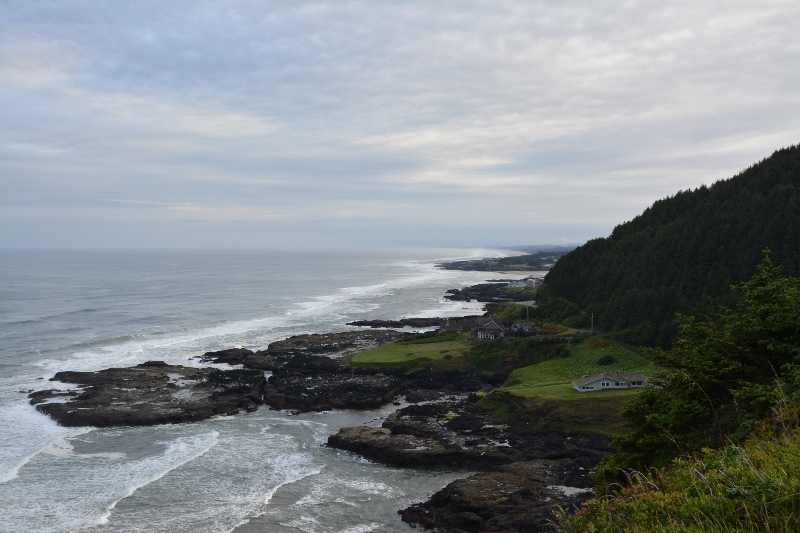 The route from here to Yachats had good views of the sea and many vacation homes and some resorts. In contrast to yesterday, saw more of them with “no vacancy” signs. Yachats was a small vacation town and not much business open when I cycled through. After town the route climbed some and picture above was taken. I also encountered my second tunnel. 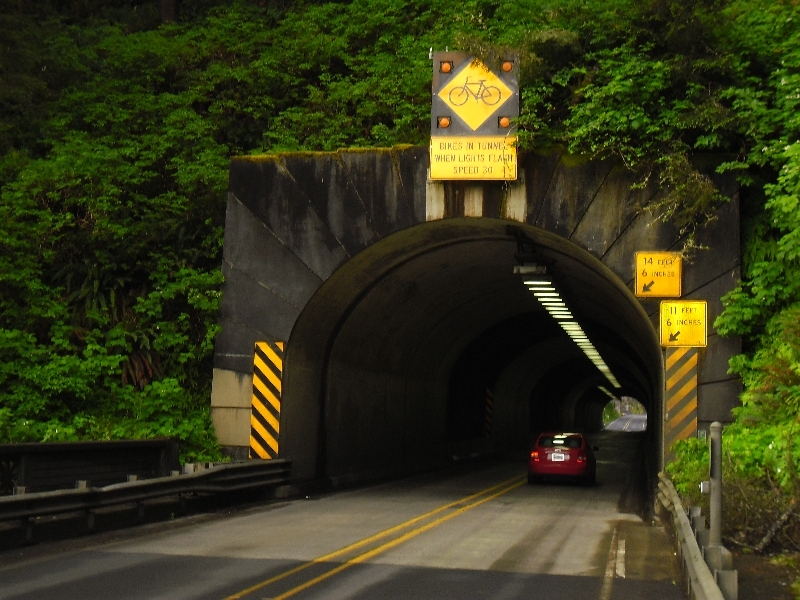 This one also had a bike button that you pressed and caused flashing yellow lights on both sides of the tunnel. After the tunnel, climbed some more and had good views of the lighthouse looking back along the shore. After that some turnoffs to Seal Cove. 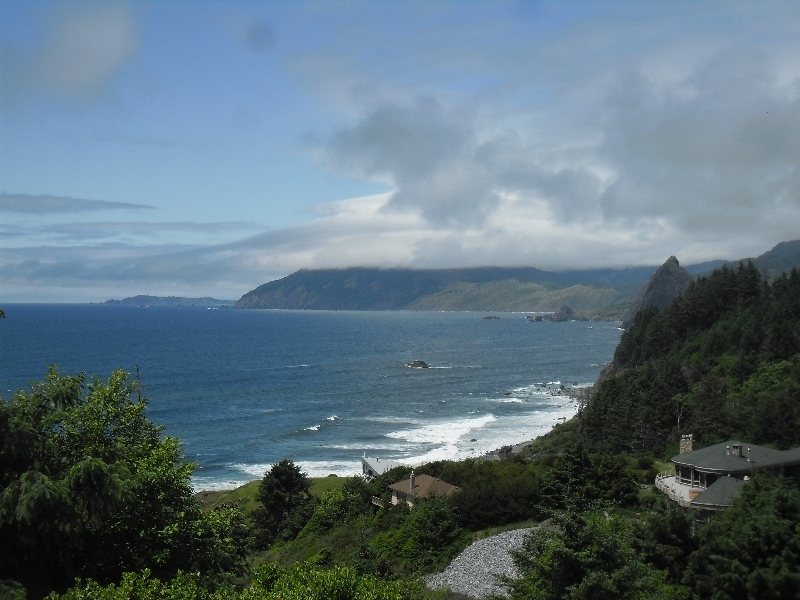 This next stretch of coast had fewer vacation homes and was excellent for views from above along the coast. At about 26 miles, descended and it became flatter. There were now also dunes between the road and sea and fewer ocean views. The town of Florence started early and was spread out. Stopped here for a later breakfast at 35 miles. It also started getting busier here. Florence and south seemed to be big area for renting ATVs to go riding around the dunes and saw many cars with ATVs on them and also places to rent. After this climbed a bit more and then descended down into a bay where first came through Gardiner and then Reedsport at 58 miles. By now I was ready for lunch for real. From Reedsport it was inland to Winchester Bay and then a good climb up and then down via Lakeside. This next section was again through the woods and was busier on the road. By 78 miles I could start to see the large bridge into North Bend. It also had a push button that would light up the flashing lights. It was a bit slow climbing first and then descending on other end of the bridge. Despite there being a lot of traffic, most all was patient and careful in passing. On reaching the other end, saw a pair of cyclists heading the other direction. That makes four groups I’ve seen heading north. Haven’t seen any heading my direction yet but it is also harder to pass. Town of North Bend was busy but made my way through grid of streets and a ways towards Charleston. Here had made motel reservations and hence good place to stay. Overall, no rain today and while the wind came from south, didn’t notice it most of the time. A wet day of cycling along the coast. 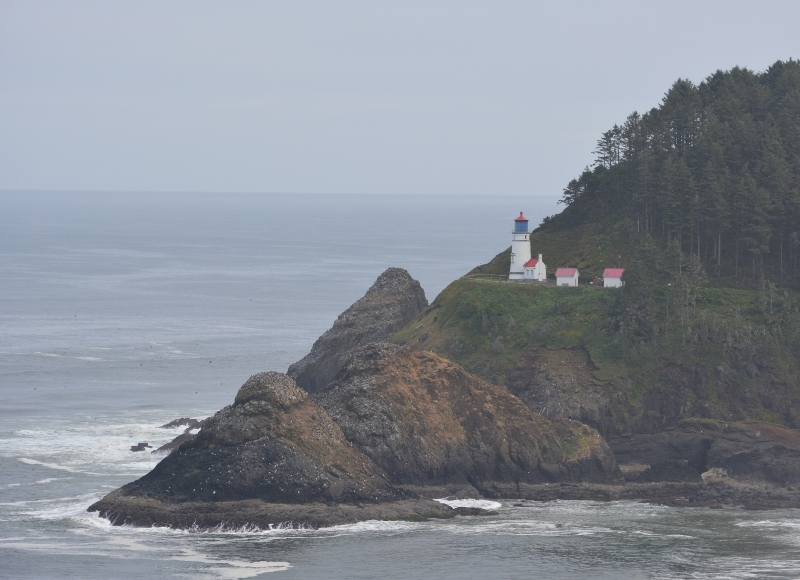 I came through many small coastal towns today: Pacific City, Neskowin, Lincoln City, Depoe Bay, Newport, etc. Weather forecast said “showers” and I had three periods of such showers today. First from mile 5 to mile 30, next from mile 55 to mile 65 around last from mile 75 to mile 88. Also had consistent winds from the south (head winds). One advantage of being further north is there are long days and I was on the road before 6am. 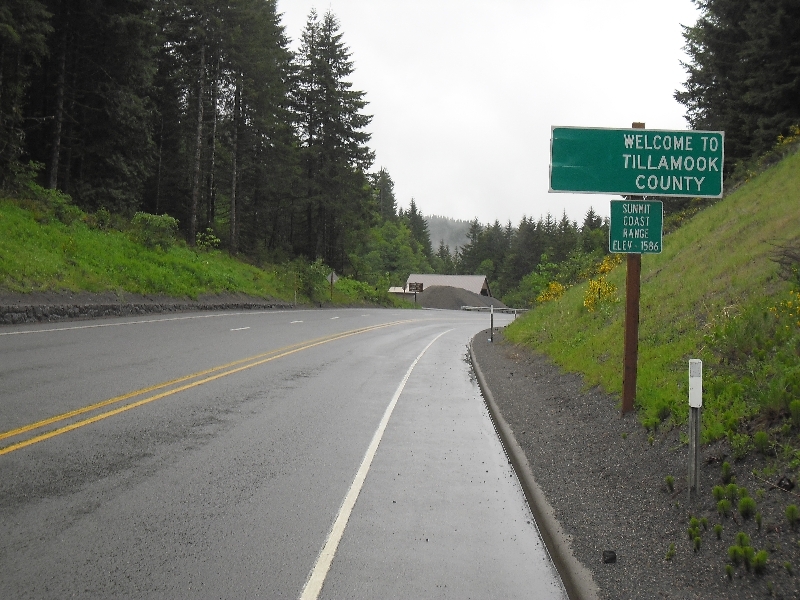 Town of Tillamook was still asleep as I cycled through. I planned to stop at convenience store for muffin but was through town before I knew it. Fortunately, a little south of town at 5 miles there was nice place to stop. After I finished my mini-breakfast and got back on the road it started to rain. Highway 101 didn’t have much traffic and there was a reasonable shoulder. At 12.5 miles I turned from the highway though to take the back route via Sand Lake. 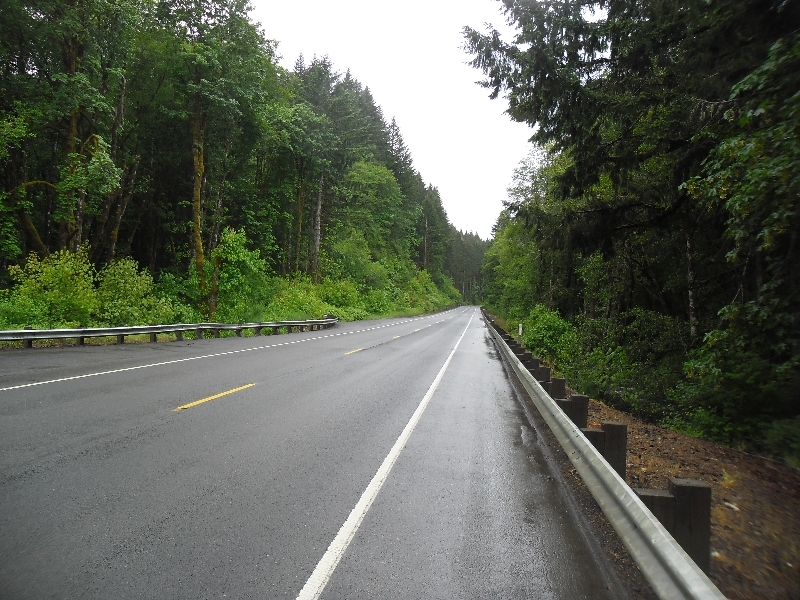 This was nice quiet road and came into Pacific City at 24 miles from back way. At some points the rain started coming down heavier and local utility workers remarked as I came past their job site. At 28 miles I rejoined the 101. 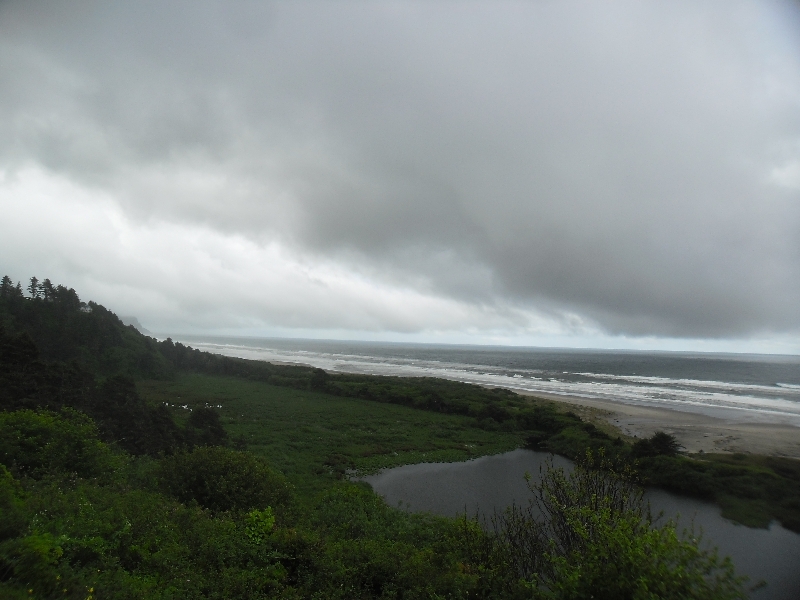 Here it went along the coast with some nice overlooks as shown in photo above. Still had reasonable shoulder and not too much traffic. Just past Neskowin at 36 miles the road started a good climb and a few miles later came to 752 feet at top of the hill. Unfortunately on the downhill was cold since I wasn’t exercising as hard. A few miles later was able to warm up. 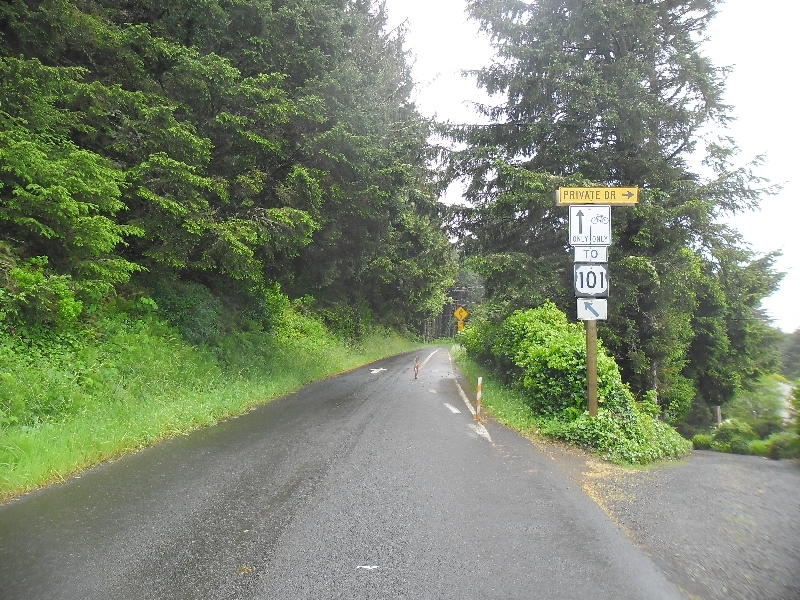 Just past this, a road came in from Corvallis and 101 became much busier the last miles into Lincoln City. Stopped in Lincoln City for a brunch at 45 miles. The sun came out and I could actually see my shadow! It also became a little warmer. The city sprawled for a while and took a bit to get through it. After this went south and along town of Depoe Bay. Not much further at mile 61 was a sign to the right indicating the Oregon Coast Bike Route went to right via Otter Crest. The Otter Crest Road was a great little road. Fairly quickly it became a one-way road with cars on left and bikes on the right. It climbed up the hill with ocean down below. Perhaps climbed up to 500ft or so with some good views to sea below. Eventually came back to 101 and then were the last miles into Newport at mile 72. Was tempting to stop in Newport, but figured I could go just a bit further. Just south of main business district in Newport was a large and high bridge. This one had a push button for bicyclists. 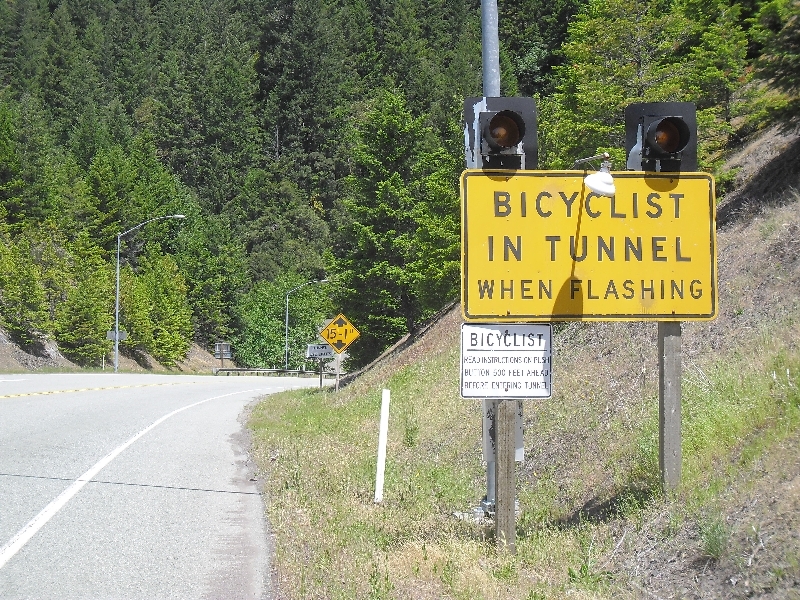 When pushed a sign with flashing light indicated cyclists were on the bridge. It was still slow with headwind but nice to have extra sign on this bridge. After crossing the bridge, the road had some shorter hills on it. Perhaps combination of hills, headwinds and end of a longer day meant I was happy to arrive into Waldport and finished for the day. Another rainy day. Decided to make it a short day and made a stop or two along the way. Overall the route took me over the coastal range and then to 101 the main highway along the coast. Ate breakfast in Forest Grove before I left. There was a light rain starting out and hence the roads were wet. Crossed main parts of Forest Grove and then followed OR 8 out along Gale Creek. After 11 miles it came to intersection with OR 6. Stopped here briefly at gas station to get a snack. 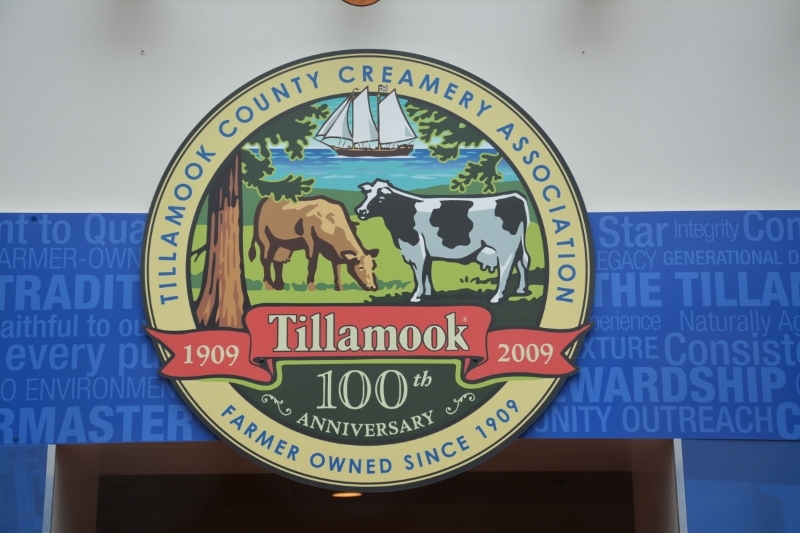 Asked if there were any stores between there and Tillamook and was told there were none. That turned out to be incorrect as I later found out. After this the road slowly climbed as it followed Gale Creek. Around 17k miles the grade increased as it climbed away from the creek. There was a nice lookout over site of a huge 1933 fire. Just after 20 miles reached the summit of the road, elevation 1586 feet. From here it would follow the Wilson River downhill. Unfortunately, I’d been keeping warm on ascent with extra energy but on descent was rather cold. 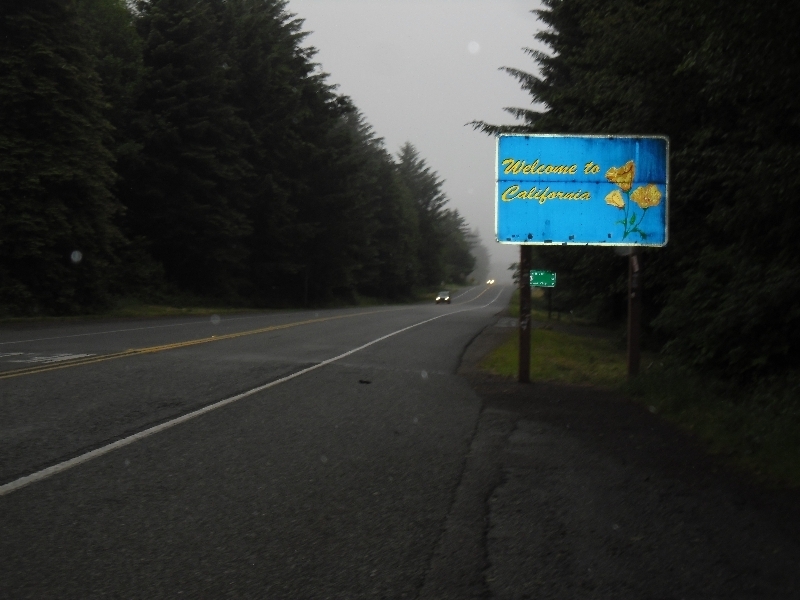 So I was happy to see signs for visitor center for the Tillamook State forest at mile 32. I arrived 10 minutes before they opened. In 1933 there had been huge 200,000 acre fire here and then after that other huge fires in 1939, 1945 and 1951. Residents noted it must have a “six year curse”. The state inherited a lot of land for non-payment of taxes and eventually this became a state forest. There was also a huge replanting effort with some 72 million trees planted in 1950s, 1960s and 1970s. Overall nice displays here and fortunately also warm and dry. After this another 22 miles mostly following the river and I was down to Tillamook. 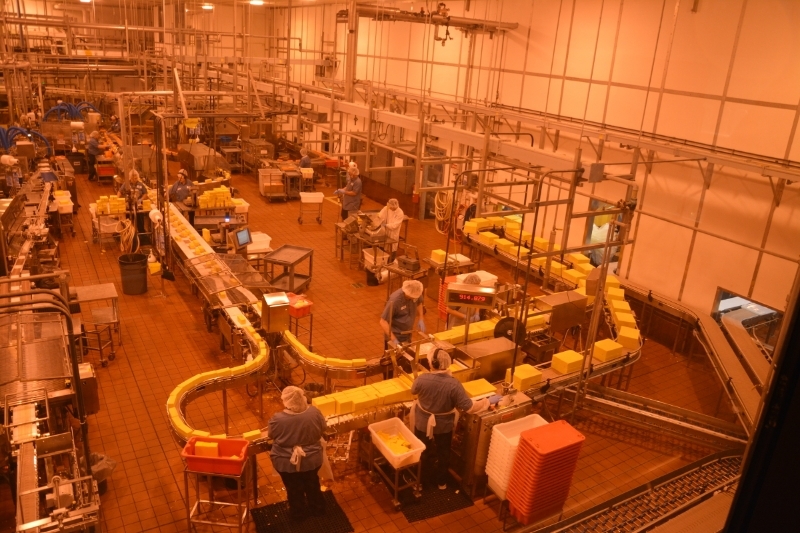 Weather hadn’t improved much, so first had lunch and then visited the Tillamook cheese factory. 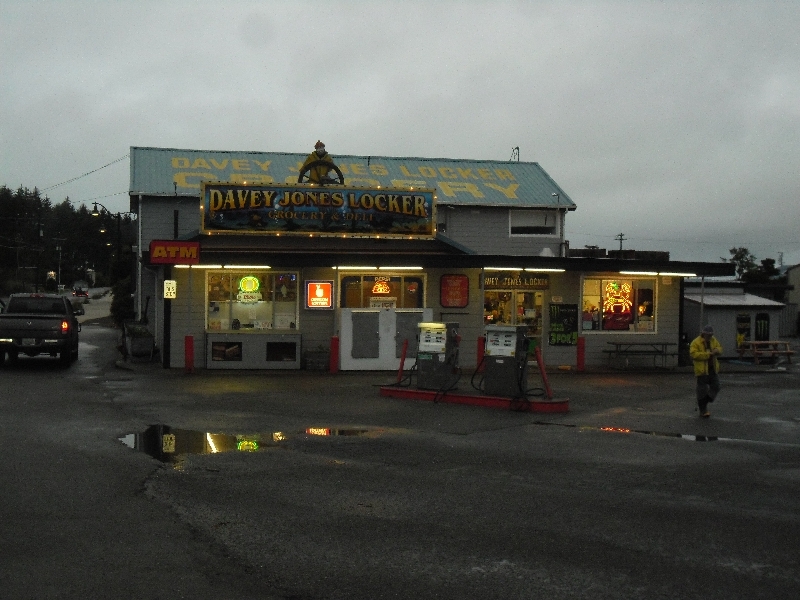 The next town with motel was 27 miles further south and into both headwind and rain. 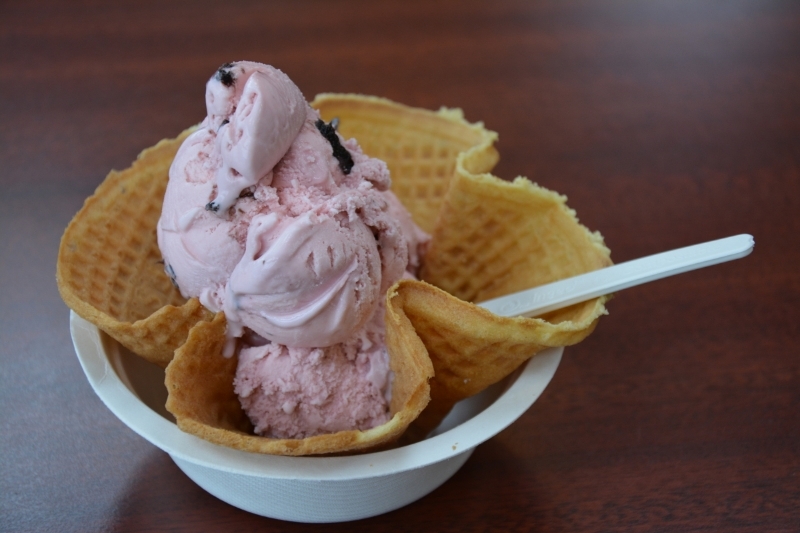 I had plenty of time, but decided to keep it easy today and stopped in Tillamook. Forecast is slightly better for tomorrow so will see how the weather does then. A wet start today. My bike was fixed and back from the shop. I had contacted a former boss of mine and set up a meeting for 3pm in afternoon. So overall plan was to cycle down to West Linn first to meet with Rajeev and then to ride from there to west of Portland. The day started overcast with a light rain. It really didn’t change much at all. Given a 3pm meeting I waited until the 11am motel checkout time before getting on the road. This was my first case of cycling with the trailer. Overall it handled well. The wheel tracks very closely to the normal back wheel. I can feel a bit more drag but overall it doesn’t change handling much other than having bike be a little slower. First 11 miles were mostly on a bike trail along I-205. In addition to rain, there was also a cold wind from the south. Fortunately, generated just enough heat so was comfortable. At 11 miles was the Clackamas Town Center mall. Stopped here for lunch and also looked around the mall until shortly before 2pm. Nice to be dry and inside. 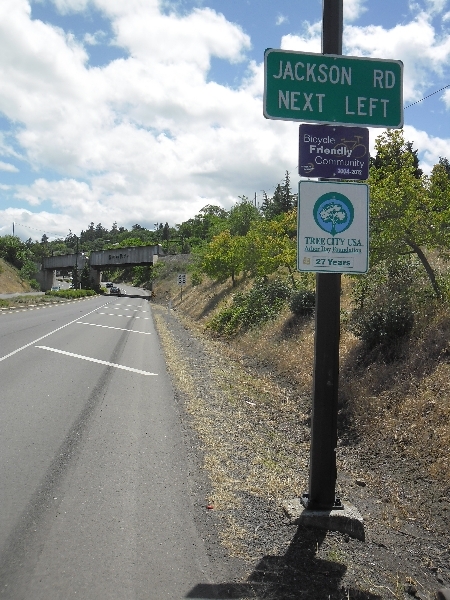 At 2pm I then cycled down to West Linn via Oregon City. Here is was nice to catch up with Rajeev and we talked until about 4:30pm. I’d cycled 18 miles and still had a ways to go. Fortunately, Oregon has nice long summer days. The road via Lake Oswego was busier and after this there was some hill to climb over to Tigard. After Tigard I was on familiar terrain as this was also route I cycled before on way to Frys store. The rain still continued but without too much difficulty came back into Beaverton and then turned west towards Hillsboro on OR-8. This was larger road but with reasonable shoulder. In Hillsboro I got turned around and had several extra miles before I asked and got onto OR 8 again. Here it was riding west and via Cornelius and then into Forest Grove. Was a bit hungry, cold and wet but had a good day overall and nice to be back on the road again. 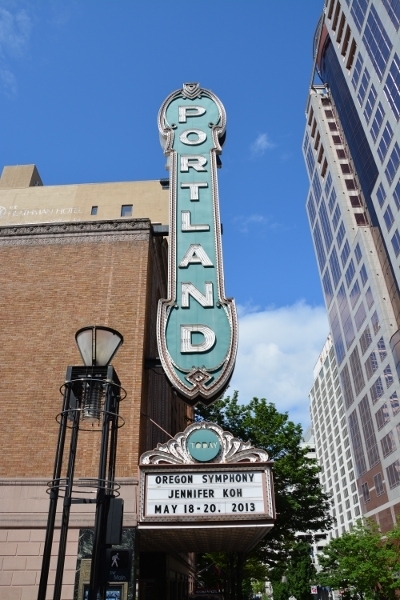 A long but otherwise uneventful flight brought me to Portland, Oregon. 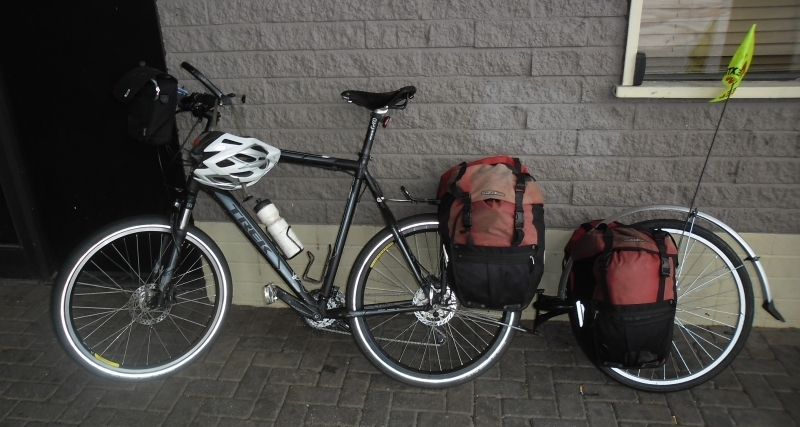 Here I brought my bike in for service and prepared for transition to my self-supported bicycle ride. I brought the two broken rims to Sugar Wheel Works and spoke with Jude. She took the information down and followed up with Velocity since the way these failed appears to be a defect. Apparently, it may have been a defect they fixed. However, the good test will be how well the newest rim does since it was a 2013 edition and the two previous failures were with rims bought in 2012. I picked up a bicycle trailer I had ordered and shipped to Portland (thanks Laura!). Haven’t ridden with it yet, but plan is to ride with this trailer since I don’t have a rack for front panniers. 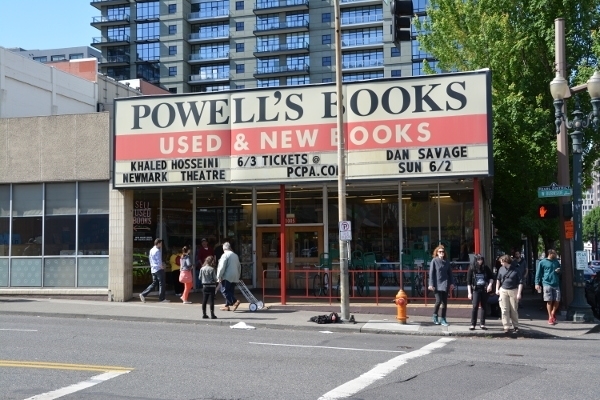 I also picked up a few other things around Portland. In return, I also mailed off to Colorado things I wouldn’t need for next weeks on the road. This included having less clothes, foreign travel adapters and other things. I also anticipate that many upcoming nights will be in motel rather than tent, so replaced the tent with a bivy sack and mailed off the tent. My bike came back from the shop. A full tune including cable replacement was done. Also a new derailleur hanger, new chain and new brake pads. Spoke tension adjusted for the wheels. Otherwise it was also a good time to walk through familiar haunts and neighborhoods as well as visit with folks I had worked with. In that regard, I also rented a car one day and drove down to visit folks at a company we’ve worked with. Last steps will be to pick up the car from service and then take trailer on the road. Plan is for a short day on May 22nd since rain is predicted and also that I’m visiting one more person for a late lunch. Likely only find new motel on west side of town. Real departure from Portland to the Oregon coast will be on the 23rd. Departure day in Cape Town, it will soon be farewell (for now) Africa and hello Portland. My plan is to do my own self-supported ride through some of the western USA before returning to work in Austin. Depending on how quickly I can get the bike serviced and get back on the road, this should leave ~30 cycling days until last week of June. During the last week of June, plan is to ride the “Bicycle Tour of Colorado” (link) and then fly to Austin on June 30th to return to work on July 1st. I’ve plotted out an approximate route along with rough time frames that should be possible in 30 days along with leaving a few options to alter things if it goes awry. Should be slightly less than 2000 miles.